The time of the month has come where we would like to take this opportunity to express our heartfelt gratitude to all of our March supporters from HESC and WCT. Special thanks to Nicole Benjamin Fink from Conservation Beyond Borders for the generous donations towards the orphaned elephants in our care. We are humbled by your generosity and kindness. Thank you! Our friends at The Platter Project have done it again! We continue to receive donations via the Platter Project. Special thanks to Di and the family for your continuous support and generosity .We are exceptionally grateful. Many thanks to Ronald Ederveen who generously donated two laptops towards the Hoedspruit Endangered Species Centre. It was wonderful to have Ronald visit the centre. We are very grateful for the support. Thank you! Special thanks to Capmor Stationary for donating printing paper and crayons towards our community outreach projects. Special thanks to Highline Tours for your continuous support towards the Hay for Horn campaign. We are humbled by your generosity. Thank you! 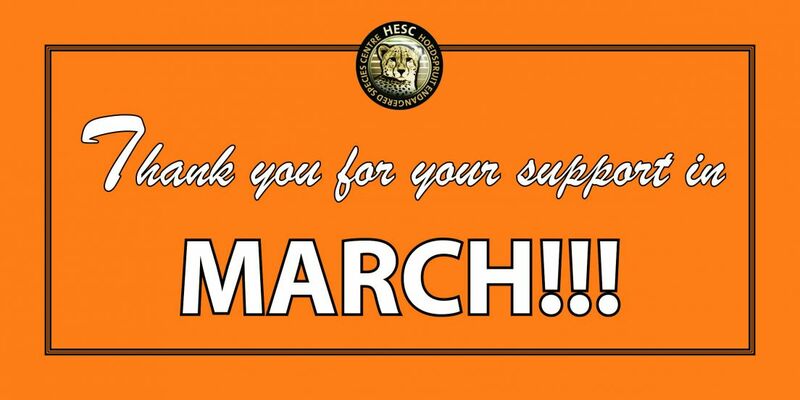 Thank you to all our supporters that have added the HESC as their chosen beneficiary on the Woolworths MySchool MyPlanet Programme. Every swipe makes a difference. We raised a total of R906, 98 in the month of March. Thank you to everyone that continues to swipe for a cause!